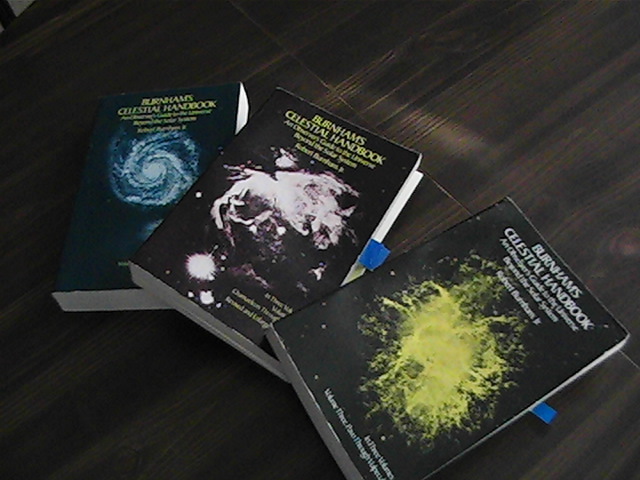 Just a heads up, since new blog posts are probably more attention-getting than new pages: thanks to the kind offices of a fellow Cloudy Nights forum member and his friend, a list of the DSOs from the monumental Burnham’s Celestial Handbook is now available on the sidebar. That’s 1160 objects north of -30 declination (plus 6 Messiers that are just south of the cutoff)–out of the total of 1880 listed in all three volumes–plenty of goodies to keep a deep sky fanatic busy for a long time. Go check it out. You are currently browsing the 10 Minute Astronomy blog archives for the day Tuesday, July 17th, 2012.